Everyone who has been (mis)fortunate enough to use the London Tube will probably have experienced delays or unexpected closures. There isn't much an app can do with regard to actually fixing the Tube, but it can let you know quickly and easily what the current state of play is. 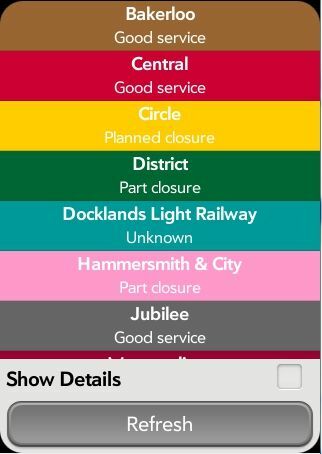 tubeInfo is a simple app that allows you to quickly and easily see the status of all the London Underground lines. It shows the overall status as well as details of which stations are closed and the relevant advice from TFL. tubeInfo now also includes a Tube Map as well as a Journey Planner. Neither of these require connectivity, so you can check where you are and where you're going while underground.